The Biergarten Restaurant in Epcot was one of the most unique dining spots that we have tried so far at Walt Disney World. It is in the Germany pavilion in Epcot and is designed to recreate a German Oktoberfest celebration. There is dancing, the polka and a floor show. Everything is family friendly and fun. Plus, the whole meal was made even better since it was on the Disney dining plan. Instead of a cozy intimate table for two at the Biergarten Restaurant we were seated at a long table with eight other people. Interactive music show has guests clapping and waving drinks. Birthdays and anniversaries are recognized from the stage. The kids even dance in a recreated version of 'simon says' while the polka is played on an accordion. I was a little concerned about my husband. The atmosphere is fun but it may not be enjoyed by introverts. Everyone at our table at the Biergarten Restaurant was in the mood to be outgoing and fun. Hubby and I both had a great time at this Epcot dining experience. Frankly, it was almost impossible not to enjoy the meal. For starters, the service was excellent. My reservation was flagged with a food allery alert. Our server at the Biergarten Restaurant took this seriously and asked twice if I was interested in speaking with the chef. I was impressed. The variety of dinner buffet items at the Biergarten is equally impressive. There was a tasty cauliflower soup and I also liked the potato dumplings. Hubby said that the spratzel was exceptional. The roast pork and red cabbage were also tasty. 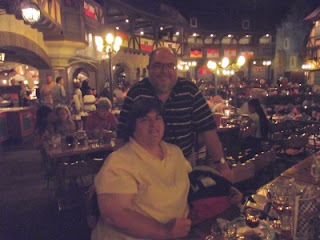 I felt that the Biergarten Restaurant in Epcot had the most extensive menu of any place that we tried on this vacation. It is all decidedly and delightfully German. The buffet items also included salads, pretzel bread and a delicious chicken schnitzel with yager sauce. A full menu is on the Disney website. Desserts at the Biergarten included a delightfully light Bavarian cream cake that melted in your mouth. The red berry fruit compote was also very good. Other desserts at the Biergarten included cookies and apple strudel which were all tempting. Our server did a great job with keeping everyone's drinks straight for refills, removing plates and answering questions. She was from Berlin and enjoyed talking about her country. The conversation didn't take her off task. Multitasking was her specialty. The correct checks were delivered and handled efficiently. We couldn't ask for more and tipped accordingly. Not everyone at our table was enthused about the tipping policy enforced by the Disney dining plan. An automatic gratuity of 18% is added to groups of six or more. The party of six that we were with clearly weren't happy about the percentage. However, everyone was pleased with our service at the Biergarten. I'm glad that our server received her 18% and hopefully a little more.